The Mechanics of Apple & Samsung's "Profit Trap"
In my post on Apple & Samsung's Profit Trap, I had explained how profit share was a flawed metric for gauging the long-term health of a company or platform. I had also detailed the perils of relying on a premium hardware strategy. While this post generated a lot of discussion, the mechanics of the "profit trap" still seem to be poorly understood. The goal of this post is to identify the primary customer segments and regions that could signal a shift in the basis of competition. For the purpose of this discussion, let's restrict our analysis to the premium smartphone market, specifically Apple's iPhone and Samsung's flagship Galaxy devices. Before we begin, we need a clear understanding of the characteristics of Apple and Samsung's most and least profitable (or valuable) customers. Their most profitable customers -- (1) are extremely brand loyal, (2) buy the highest priced device SKUs/variants, and (3) upgrade frequently (possibly with every product refresh) and own multiple devices from the brand across product categories. These customers are also likely to be more engaged with the ecosystem, but this is a secondary benefit because of the limited size of this population. In other words, these customers are more identity-focused and than utility-focused. Unfortunately, most analysis on the premium smartphone market begins and ends with this segment. Their least profitable customers (or potential customers) -- (1) are not particularly brand loyal, (2) buy lower priced device SKU/variants, and (3) do not upgrade frequently and are just looking for a "good enough" device. In other words, these customers are more utility-focused than identity-focused. 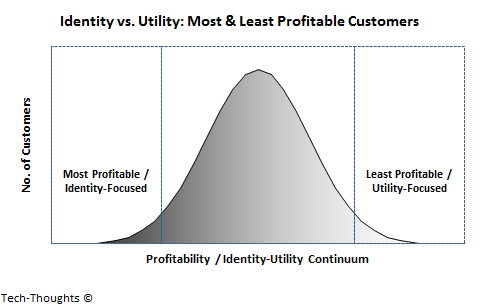 The remaining (mainstream) customers would be distributed across this identity-utility continuum. The least profitable, utility-focused customers are also the harbingers for a permanent shift in the basis of competition. Since their (limited) needs are met first, they are the first group of customers to begin valuing other attributes (price, flexibility of choice, etc.). The proportion of least profitable customers in a market depends on price parity between brands, i.e. if an iPhone/Galaxy is priced at roughly the same level as other smartphones, then it would draw a higher proportion of less profitable customers as compared to other markets. Therefore, the distribution of most and least profitable customers is highly region-specific. Most readers are already aware of the differences in pricing between the US and European smartphone markets, for example. Based on this pattern and on Ben Thompson's characterization of three iPhone markets, I've divided the premium smartphone market into three regional tiers. In these markets, the true price of a premium smartphone is concealed from customers. Postpaid customers pay the same monthly contract price irrespective of their device choice, most of which are priced from $0-$199. Unsurprisingly, these are the strongest markets for premium devices. This also means that these markets have the highest proportion of less profitable customers. 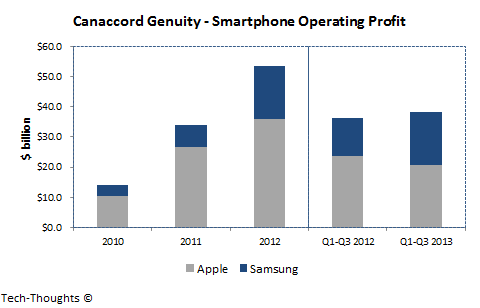 However, Apple & Samsung aren't at immediate risk in these markets because of the nature of pricing. T-Mobile recently ended smartphone subsidies and began offering devices on payment plans instead. 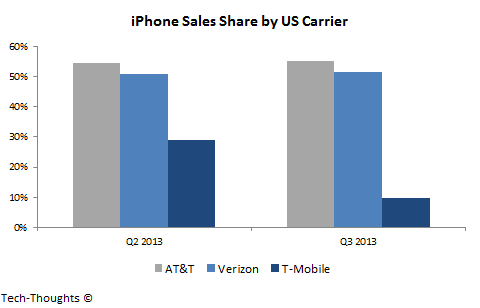 As a result, device prices were no longer concealed and less profitable customers bought mid-range devices instead. Of course, this risk will only become significant if other carriers follow T-Mobile's example or if the pre-paid model gains popularity. Therefore, the risk in tier-1 markets is not immediate. In these markets, the price of a device is subsidized by carriers but the price of the contract varies based on the device purchased. Therefore, the proportion of less profitable customers is lower in these markets (compared to Tier-1), but still quite high on an absolute basis. Since pricing is proportional to actual device cost, Apple and Samsung run the risk of losing customers to "good enough" rivals starting with their least profitable, utility-focused customers. 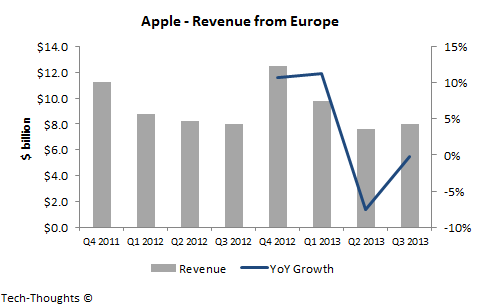 Unsurprisingly, Apple's YoY revenue growth in Europe has already slipped into flat/negative territory (we don't have region-specific revenue data for Samsung). In these markets, customers need to pay the full price of the device upfront and carrier subsidies (if any) kick in later in the form of refunds (as in China). These markets have the smallest proportion of least profitable customers. This is because any customer who buys a high-end device is specifically looking to spend up on a device of their choice. Since pricing is completely transparent, Apple and Samsung face the highest risk of losing less profitable customers to "good enough" rivals. Of course, the population of these utility-focused customers is much smaller than it is in other markets. Given these regional patterns, it is obvious that success in Tier-1 markets like the US and Japan is to be expected and is not very helpful in predicting long-term trends. Analysts should track Tier-2 markets closely (specifically, Europe) to watch for a shift in the basis of competition. Once this shift occurs, premium OEMs could face the most pressure in these Tier-2 markets where the absolute size of their less profitable segments is larger. Given the smaller population of less profitable customers in Tier-3 regions, any sizable decline there would signify that the basis of competition is beginning to shift among Apple/Samsung's mainstream customer base as well -- an even more worrying sign.